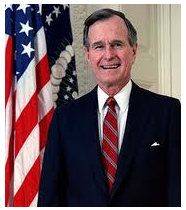 He opposed the “Freedom of Choice Act,” a bill which, he said, “would impose on all 50 states an unprecedented regime of abortion on demand, going well beyond Roe v. Wade.” He added that “it will not become law as long as I am President of the United States.” He also stated that “I will veto any legislation that weakens current law or existing regulations” pertaining to abortion. He vetoed 10 bills that contained pro-choice provisions, including four appropriations bills which allowed for taxpayer funding of abortion. In addition, he vetoed U.S. funding of the UNFPA, citing the agency’s participation in the management of China’s “forced abortion” program. He defended the “Mexico City Policy,” which cut off U.S. foreign aid funds to private organizations that performed or promoted abortion overseas.